With our unique NWS belt drive you can cut harder and faster with a 3hp motor than with a 5hp basic flat belt motor. This results in less cost to you now and in the future! We believe in giving the customer the best tools available. When we looked at the other routers available for the stone market we were appalled. Nowhere could we find a router with a spindle that is guaranteed to never slip and rob power from the bit. Very few of them floated on a protective layer of water and the ones that did, were not balanced very well. At the time we designed this router most of the routers that had hydroplaning bases were only available as an add-on, at extra expense! We also found that one of the biggest headaches of using other routers was having to carry around a converter box for the 3 phase motors - great... more parts to breakdown. 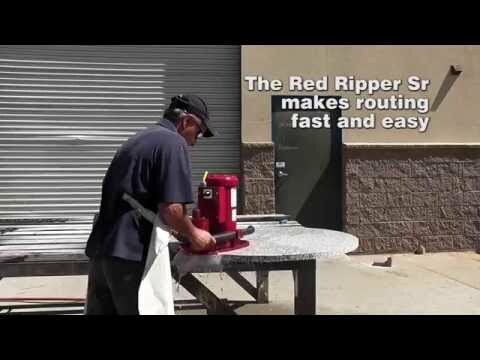 We built the Red Ripper Sr Stone Router from the ground up to be a no-frills, high-performance, easy to use router, exclusively for the stone industry. For years you have asked us to make our router variable speed and we could not in good conscience do so: we knew that the normal technique of using a large extra box with a large heavy cable was not something you would want added to your router. Now that is over and we found the perfect solution! Our variable speed Red Ripper Sr Stone Router is manufactured with a solid-state water-cooled onboard controller. This controller gives you the flexibility to tune your bit life and production rate to your preference, bit construction, and material by adjusting the speed from 0 to 10,000 RPM. This can be accomplished via the operator-facing controls on the router itself. That said, most people want a variable speed router to use for polishing. This, and any other large router, isn't the tool for this task: large routers are too heavy to allow you to feel the polish. 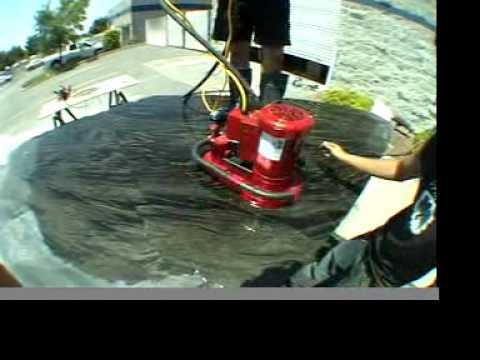 If you want to use a router for polishing, check out the Red Ripper Ultralight Stone Router! The 2HP Red Ripper Sr Stone Router can be rewired in the field for operation on 220-240 volts. The GFCI shipped with the 2HP router is only rated for 110-120 volts, so we highly recommend installing and using a properly rated GFCI breaker instead of the built-in inline breaker if you intend to do such a modification. NOTE: The Red Ripper Sr Stone Router is NOT designed for polishing operations: the weight prevents producing a smooth and consistent polish. If you need to polish with a router, we recommend using the much lighter Red Ripper Ultralight Stone Router. Otherwise, simply use a right-angle grinder with polishing pads. WARNINGS! This product contains chemicals including lead, which is known to the state of California to cause cancer and birth defects or other reproductive harm. For more information go to www.P65Warnings.ca.gov.